Search our site for products, events, articles and other Argon related information. 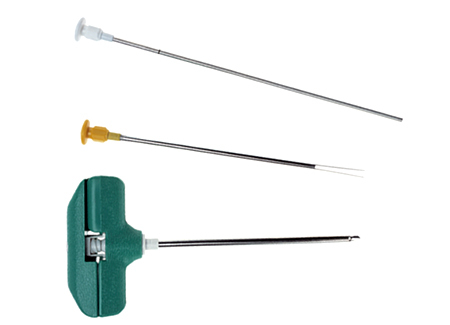 T-Lok™ Bone Marrow Biopsy Needles are designed to provide quality biopsies by entrapping bone marrow in the needle without altering the sample. Please provide us with the following information so that we may respond to your request. An Argon representative will be in contact with you about your order. Please contact customer service for additional information. © 2018 Argon Medical. All Rights Reserved. Sign up to receive our latest news and product announcements! This website is intended solely for the use of healthcare professionals. A physician must always rely on his or her own professional clinical judgment when deciding whether to use a particular product when treating a particular patient. Argon Medical Devices, Inc. does not dispense medical advice and recommends that surgeons be trained in the use of any particular product before using it in surgery. The information presented is intended to demonstrate an Argon Medical Devices, Inc. product. A physician must always refer to the package insert, product label and/or instructions for use, including the instructions for cleaning and sterilization (if applicable), before using any Argon Medical Devices, Inc. product. Products may not be available in all markets because product availability is subject to the regulatory and/or medical practices in individual markets. Please contact your Argon Medical Devices, Inc. representative if you have questions about the availability of Argon Medical Devices, Inc. products in your area. Argon Medical Devices, Inc. or its divisions or other corporate affiliated entities own, use or have applied for the following trademarks or service marks: Argon, Argon Medical Devices, Atrieve, BioPince, Choice Lock, CLEANER, CLEANER XT, CLEANER 15, First PICC, FirstStic, FlexStrand, MaxiCell, Option, Osty-Core, Pro-Mag, SKATER, Slip-Coat, SuperCore Techna-Cut, TLAB, T-Lok, TruCore, TruTrack, UltraStream, V-Stick, V-Mark. All other trademarks are trademarks of their respective owners or holders.